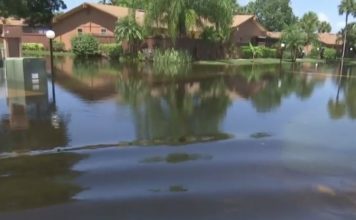 More than a year after historic flooding damaged hundreds of homes and several surrounding businesses near Island Park Road in south Fort Myers, long-term prevention efforts by Lee County have still not begun. “I’m very concerned. I don’t want to spend the time and energy in making my house a home because I don’t know the next time that the waters are going to come in,” said Hayley Kinlaw, a resident in the Royal Woods Community off Island Park Road. Kinlaw recently moved back into her home, after moving to nine different hotels over the past year with her husband and two children. She said her 6-year-old has a lung condition, and relies on a breathing tube. Heavy rainfall started falling on August 25, 2017 and didn’t stop for two days. According to a Lee County funded engineering study, certain areas got between 10 to 12 inches in the three-day period. The area where ten mile canal, the county’s largest drainage system, crosses underneath U.S. 41, just north of Alico Road was hit hard by flooding in late August and again after heavy rain fell during Hurricane Irma. 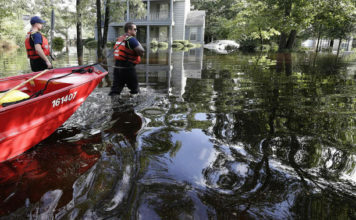 More than $15 million in flood insurance claims were paid out in that zipcode, according to data from FEMA. Two community groups formed in the wake of the disaster with the same ultimate goal: keep it from happening again. Both are convinced the devastation was not due to heavy rainfall alone. Ted Ehrlich, who was trapped in his neighborhood all the way at the end of Island Park Road, spearheaded efforts to research the problem. The Ten Mile Canal Community Group self-funded their own engineering consultant, and then released their own report that presented solutions to the county. Their report points to problems also highlighted in a county-funded study of the canal: lack of maintenance and a failure to complete the canal to design. The February 2018 Johnson Engineering study pointed out design plans dating back to the 1970s that show how the canal was recommended to be completed. While excavating, crews hit rock, and never completed the work according to the report. Lisa Absher, another resident in the Royal Woods community, started the Island Park Citizens political action committee and organized protests at the county commission. Absher also experienced costly damage to her home and was forced to evacuate. Island Park Citizens will support an opponent in the race against incumbent County Commission Chairman Cecil Pendergrass in November. “The county commissioners have been informed, they know there are issues from me and other groups. They aren’t pushing down to county staff so I believe they need to go,” she said. Both groups would like to see maintenance of Ten Mile Canal taken over by the South Florida Water Management District. The county said it is in negotiations for the SFWMD to maintain some parts of the drainage system, but Ten Mile canal is not on that list. The county has done several immediate fixes to the area, including regrading swales and clearing out culverts, according to information provided by communications director Betsy Clayton. In addition, debris has been cleaned out from neighboring canals. It also secured a grant from the federal government to remove sediment build up inside in the canal from hurricane Irma. Bids for the work were due at the end of August. “The county anticipates issuing the Notice to Proceed to the awarded contractor by Sept. 10, which would give the contractor a completion date by Jan.1, 2019,” wrote Clayton. Ehrlich said he presented his group’s proposed solutions to the county in July, but so far, said he has not heard if any of them are being considered. The county denied several requests from WINK News for an interview with senior staff, but instead provided a recorded statement with Assistant County Manager Dave Harner. “Lee County Natural Resources, Lee County DOT and the County Commissioners have taken a series of reactive and proactive measures during the past year to help with future flood mitigation for normal to severe weather events. Countermeasures for extreme events such as the heavy rains prior to Irma, and Hurricane Irma, are still being analyzed,” said Harner in the recording. Commissioner Cecil Pendergrass was also not available for an interview with WINK News, but said in a text message that he supported the efforts of county staff. The county’s website dedicated to flood mitigation efforts shows that the third phase is underway, and the scope of long-term work has already been determined. So far, the county has not commented on exactly what that long-term work will be, or how long before it begins.